Massive power and effects at a great price. The G120H DSP head has Rhythm and Lead channels for a wide range of tones, along with 16 onboard effects for instant sonic enhancement: Small Room Reverb, Medium Room Reverb, Large Room Reverb, Small Hall Reverb, Medium Hall Reverb, Large Hall Reverb, Slap Back Delay, Short Delay, Medium Delay, Long Delay, Echo Verb, Slow Chorus, Medium Chorus, Fast Chorus, Chorus Verb and Phaser. 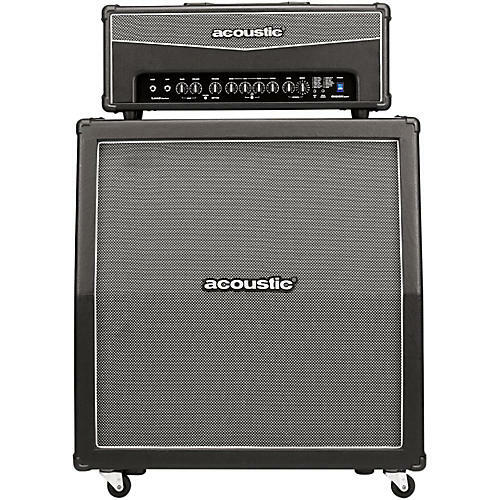 The Acoustic G412A 4x12" guitar cab gives you plenty of power-handling and stage projection. And with an 1/4", 8 Ohm extension jack, you can add another cab to move more air for additional blistering Acoustic power. Dimensions: 27.4" x 14" x 28.1"